The theme of Minted Sevens does give you a certain mint like color, a light green that is easy on the eyes. It’s also a bit of a focus on a 7 which is minted, made into a silver bar of some kind. It’s a classic title in most ways, with the symbols being all in that category, but offering a feature or two as well, so it’s not exactly like the games you had in casinos a couple of decades ago. The creator of Minted Sevens is called Saucify, formerly known under the name BetOnSoft. On the 3 reels of Minted Sevens you will find 1 payline. Multipliers and wilds are part of the deal as well, along with promises of payouts as high as $5,000. If you look at the paytable info, you will find below it some details about the features available inside and the wild symbol.. There is one symbol which acts in that role, the Minted Seven, and you will notice on the paytable that it also gives the slot’s best prizes if it happens to create its own combo of three icons. You can get paid 2,000 or 5,000 coins by a combo of three Minted 7s, depending on the bet which was placed that round (1 or 2 coins). The wild, while used as a substitute for another symbol, will apply its own multiplier of 2x for each symbol that participates. One wild will double prizes of those combinations, while two wilds will quadruple them. You have two coins that you can use each time you spin the reels. If you use one coin, then you can bet up to $1. With two coins, the wager can go up to $2. The prizes get better when the wagers use both coins, at least if you get the top jackpot combo. Your reward will be 5,000 coins at the most, which would mean $5,000. The mint like color of the game is pleasant, and I found it a relaxing experience, which is rarely the case with classic slot machines. There are only classic icons on the reels of Minted Sevens, consisting in cherries, bars and sevens. The logo is in the bottom left corner, the reels on top of it, while the paytable takes the right side. Symbols: Minted 7 (5,000 coins, wild), Blue 7 (200 coins), Three Bars (100 coins), Two Bars (60 coins), One Bar (30 coins) and Cherries (20 coins). Besides the soothing quality of the design, the wild with its multiplier is the only other thing truly valuable about it. 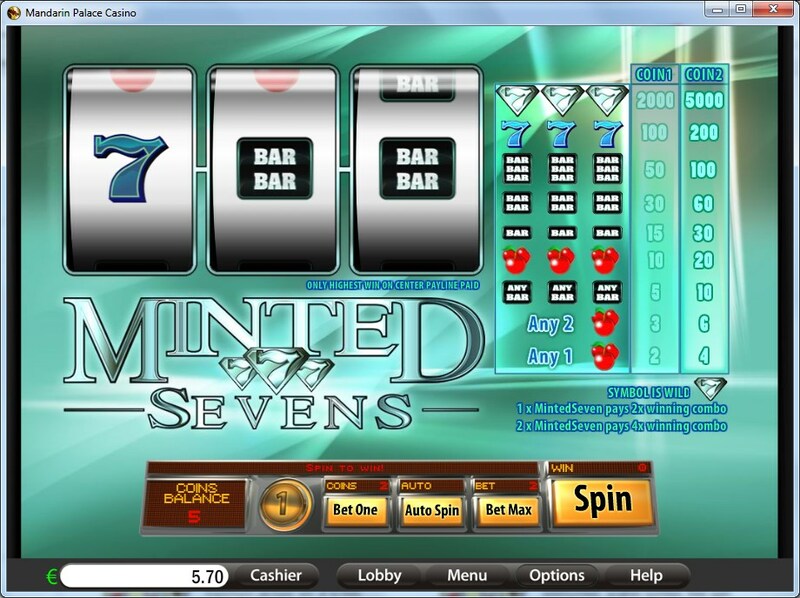 Minted Sevens can be found at any Saucify/BetOnSoft casino, where you get a chance to play it for real money or in free mode.